Those of you who follow me on instagram will remember me posting a photo of some yarn, and telling you that all will be revealed in due course. Well today, I have come to show you what I’ve been working on! It’s only a small sample so far, but I am making a Mystical Lanterns blanket for The Yarn Dispensary! This is just a fabulous shop, gorgeous yarn, gorgeous patterns, and most of all gorgeous people! I can’t express how kind, helpful and inspiring Gillian and Sam are. For anyone in Kent (or who fancies a trip to Kent! ), a visit to this shop is essential. I am busy crocheting away to make these lanterns for a full size blanket, but have made a small sample patch to go on display in the shop while I crack on with the rest – there are quite a few to make! The Yarn Dispensary are selling kits (available very soon) that include all the yarn you need, as well as the pattern, for £38.50. The yarn is Stylecraft Life DK, (75% acrylic, 25% wool) which is nice to work with, and the colours really look great together as the lanterns multiply. The sample patch has a lovely feel to it too, it drapes nicely and it will make a very snuggly blanket. The lanterns are a really nice project to work on. I have done them randomly with no planning of colours, the pattern is very easy to follow with plenty of pictures and explanation, instructions on joining, blocking etc. I was a little nervous as I have only ever joined crochet by sewing and not by crocheting, but the pattern was brilliant and the lanterns just joined together so well. I will show you the right side of the work, but the wrong side (the back) actually produces a very interesting pattern too where the cream joining yarn is more prominent, and I’m not sure which side I actually prefer! I guess you could join your lanterns with this on the front instead, but for now I will carry on as I am. So, check out my pictures below……. Here are my lanterns as they started to multiply. Clearly they aren’t joined in this picture, just spread out on my floor. And here is the little sample in it’s temporary home, on the sofa in the shop. This is the right side (you can see the little splashes of cream that almost give a dotty effect between the lanterns). And this is the back of the work, although I totally love the bold cream lines, I think it really makes the lantern shapes stand out. ……..Now head off to The Yarn Dispensary for your Mystical Lantern Kit! I owe you all a huge apology as it has been far too long since I last posted. I have been incredibly busy since I was last here, with a huge marathon of midwifery essays and exams, followed by clinical placements, and I eventually made time for a family holiday to the South of France! 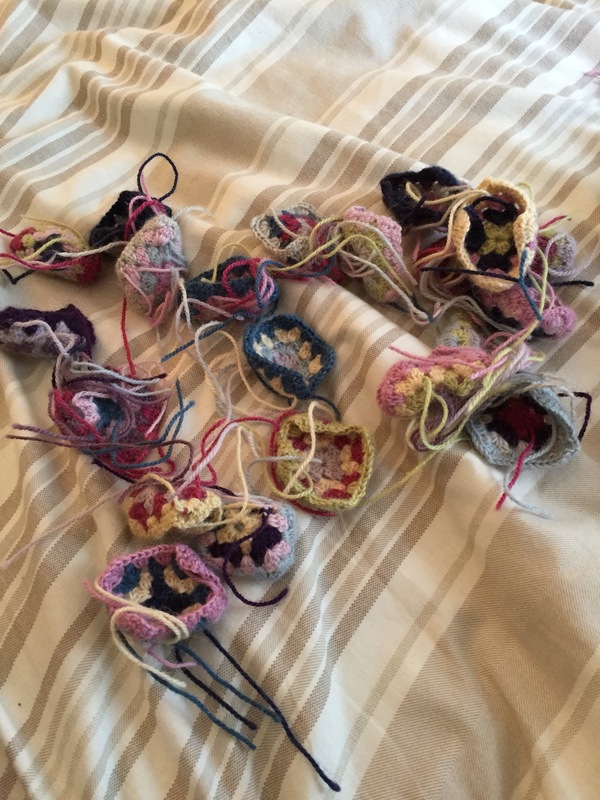 This year’s holiday was my first real holiday as a crocheter – this time last year I was attempting my first crochet project! So my suitcase actually ended up with more yarn and fabric than clothes. Thankfully we drive our car down across France each year, so I’m not limited with my packing (yes, I took my sewing machine). This also gave me some space to bring some holiday purchases home with me – check out these bargains! My mum and I set out to find some craft shops which we found a few details for online. We ended up wandering around the French town of Draguignan in search of a shop that apparently no longer existed. A little old lady came out of a nearby house and we managed (just about!) to ask her about the shop, but she confirmed it had closed a long time ago. However, she did give us directions to another yarn shop, and to a man on the local market which is where we bought the goodies in the photo above! My favourite purchases were the crochet cottons, 555m of cotton on each roll for 3€50! I did go back and buy more of these in white, blue and a second roll of the two I already had. I’m using them to make some coasters as thank you presents, and one larger one which I would like as a table mat one day when it gets big enough! The pattern is a blanket pattern – Beautiful Shells Blanket – pattern available for free on ravelry here. We stayed in a beautiful villa that had a gorgeous pool, just what we needed with the weather so great! So I spent my two weeks getting up early, crocheting in the sunshine with a cup of tea before everyone else got up. And then I would move my craft supplies down next to the pool for the rest of the afternoon, although my crocheted blankets didn’t grow too much as it was far too hot to sit under them in the heat. And just when I thought this holiday couldn’t get any better, my boyfriend of 6 years made it a holiday to remember by getting down on one knee! I said yes of course, so I came home with a gorgeous ring and a fiancé. This was the spot, over looking the lake at the Gorges du Verdon. And below, my ring. Now I’ll finish off by sharing a few of the projects I took with me. My neat ripple blanket pictured by the pool in a photo above – although it really was far too warm to work on this much! My multicoloured granny squares that I discovered under my mum’s bed (mentioned in the Buried Treasure post from earlier this year). This was my car crochet that kept me busy on the eurotunnel and on the motorways. My crocheted project bag, following the Lucy Bag pattern from Attic24. I am loving the pinks and greys I am using here. 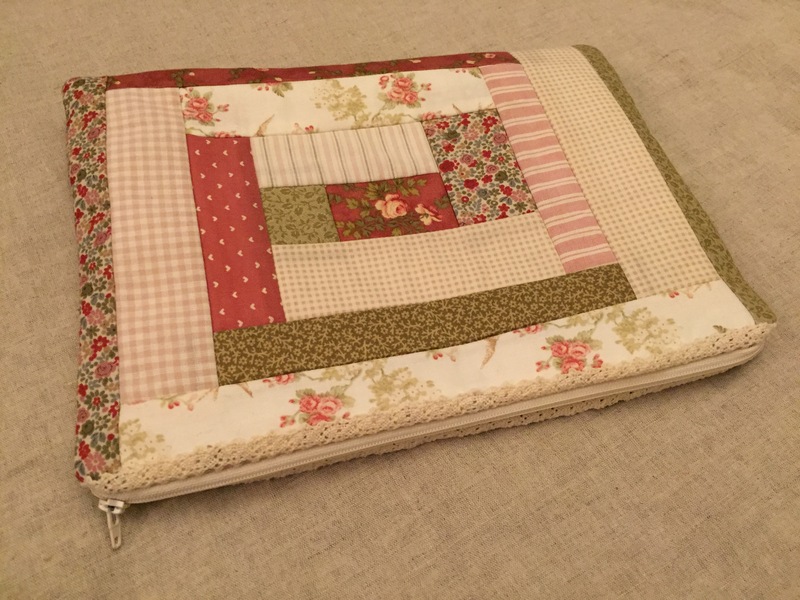 And some sewing – a Dilly Bag. The pattern is available online for £10. I had this all planned before I left home, with a bundle of fabrics ready. 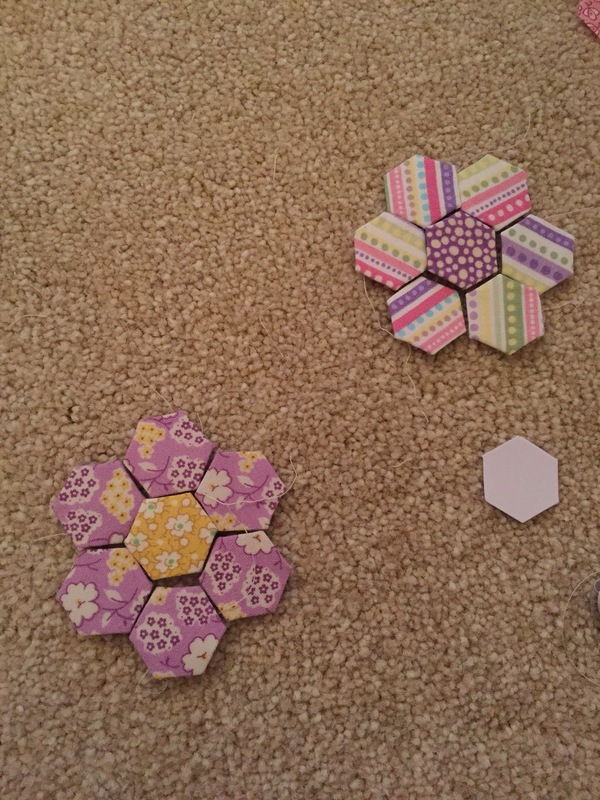 So I sat down one morning and cut out all my hexagons, and I’m still sewing them together now. So now I have made a start on the huge blog catch up mission. I’m sure there are things that I wanted to share with you that I’ve forgotten so I’ll be back for more shortly! 1) I finished making a sewing apron. It was mainly sewn together but needed top stitching. I did this project first so that I could wear it for the rest of the day! I haven’t taken photographs of it yet, I promise I will do soon. The apron is reversible, mine is linen on one side and a pretty purple and cream floral fabric on the other. I am yet to sew my pockets on, and I’d like to do some embroidery on it too as a way of personalising it – hence why I chose plain linen. 2) I made a cushion. It is very simple – made up of squares that were using up left over jelly roll strips from a previous quilt. The squares had been pieced for a long time so I put the piece on some wadding, hand quilted with some cross stitches, appliquéd on a heart, and then attached two back pieces. 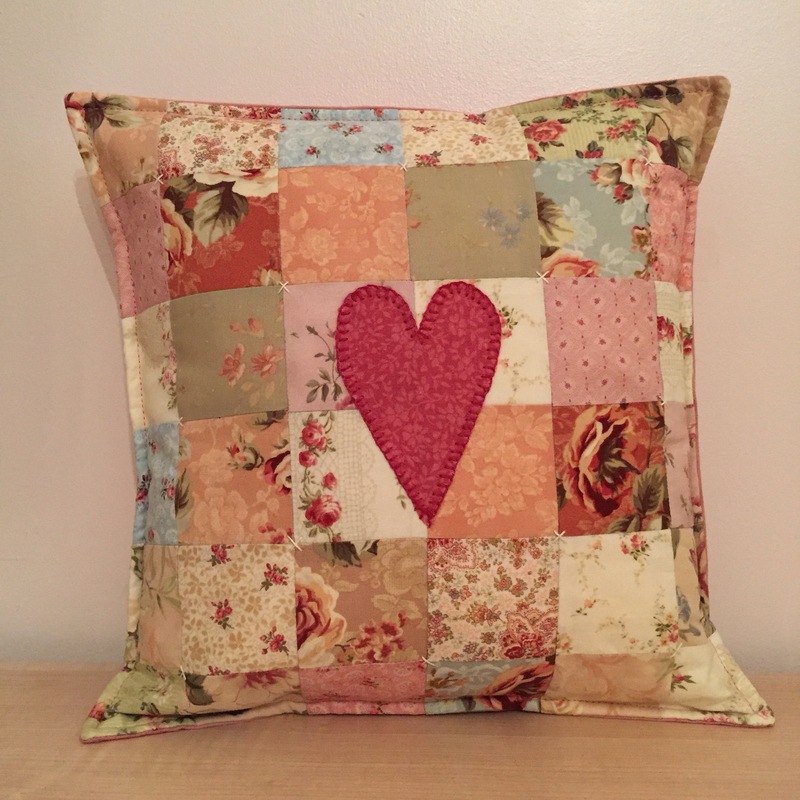 I prefer to make my cushions this way as I like that they don’t require any Velcro/buttons/zip. I cut out two pieces of backing fabric that were the same size as the front piece. I folded over about 1 and a half inches of each piece and top stitched each one down. I then placed them face down onto the front piece and stitched all around the edge. The whole thing then turns in the right way and the cushion fits inside, closing up like a pillow cover. To finish it off, I top stitched all around the edge, which I think gives it a more polished finish. I’m really pleased with it, and I love that it also matches the quilt that is made from the rest of the jelly roll! 3) I made a bag. Once again, the front was pieced but the bag needed assembling. This took some fiddling, and the zip did test my patience. But one snapped needle later, and with some help from my mum, it did come together and now I love it. I’m not sure what it’s going to contain yet – possibly the ever growing collection of alpaca granny squares! My next plans are to block my little granny squares which are a little curly, make up some baby quilt tops, and then hopefully get a few of my crochet WIPs finished! After my busy day of sewing I am looking forward to getting the hooks out this week so I hope to update you with some crochet projects shortly! Sorry for such a delay in between posts! I’ve had a very busy week! So I’ve had a good day of catching up today; I’ve tidied and cleaned, done my filing, sorted through a cupboard, made dinner so it’s ready to warm through this evening, planned my next essay and now I finally have chance to catch up with my poor, neglected blog. First things first, I’m going to show off my new fabrics. This weekend just gone, I travelled up to Duxford Imperial War Museum for the Spring Quilt Festival. They had a large display of beautiful, inspiring quilts, and patchwork/fabric supplier stands. I didn’t have anything particular in mind that I wanted to buy so I went in open minded, and managed to spend a small fortune! I only bought fabric, and I don’t have plans for half of it, so it will all join my stash and await the day I find a use/pattern for it! This first little bundle does have plans though, as I bought enough fabric in this range to make a quilt top. Here I have a jelly roll, a charm pack, one 1/2 metre piece and one fat quarter. I plan to do something in the quilt centre with the charm pack squares, and then arrange the jelly roll strips around the outside. I’m not 100% sure on the details of the design though, and I’m not ready to start it yet anyway as I have FAR too many WIPs that need finishing. I’ll wait and see how long I last though.Apologies for the poor light and picture quality – I’ll give you a better picture when I come to use the fabrics. This gorgeous little box is also going to make a quilt top, but probably a much more simple design – I was considering just rectangular strips. I want to keep the design as simple as possible to make the most of the pretty liberty prints, plus the fabric is already in rectangular pieces. And here are the other fabrics I treated myself to – these are smaller collections or random pieces that I bought purely because I liked them! I’m sure you’ll see some of them in the near future, hopefully as nice little bags/quilts/cushions etc! And this yummy charm pack! Now time for some project updates! First up is a gift I made for my mum for Mothers’ Day. My mum has a new purse which is smaller than her last, which means there isn’t quite enough room for all of her loyalty/membership cards (she has a lot!). So it was only right that I made her a little card holder. And what’s really nice is that all the fabric (except one of the lining pieces) are scraps from one of her best friends’ work, which I picked up from her at the fabric stash sale a couple of weeks ago. Here it is! And as I promised a little while ago, I’ve got some pictures of my new yarn. Drops Alpaca 4ply. It is beautifully soft and nice to work with. I am loving these, despite not really enjoying the first few. The very depressing news it that my vintage blanket is made up of 432 squares! And I’m currently working on #9. I’ve got a long way to go……So I’m off to whip up a few more before dinner! Enjoy the rest of your week, hopefully it won’t be as long before my next post! Today’s tiny project was a way of using a couple of fabric scraps I picked up yesterday at the fabric sale. I’ve fancied a little bit of hand paper piecing for a while now so this was the perfect opportunity. Mum dug out her collection of templates and papers, and I had a good old rummage through my new and existing scrap collections. 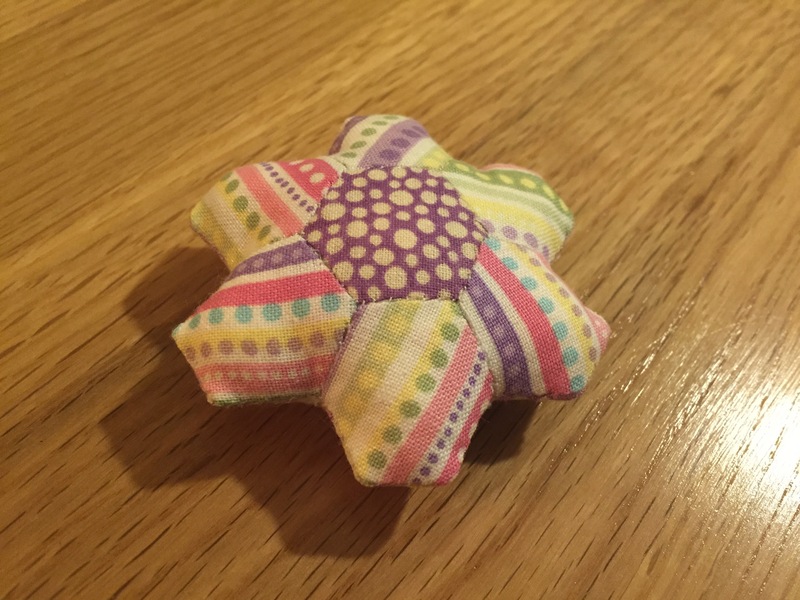 I settled for some 1/2 inch hexagons, and decided to make a little pincushion. 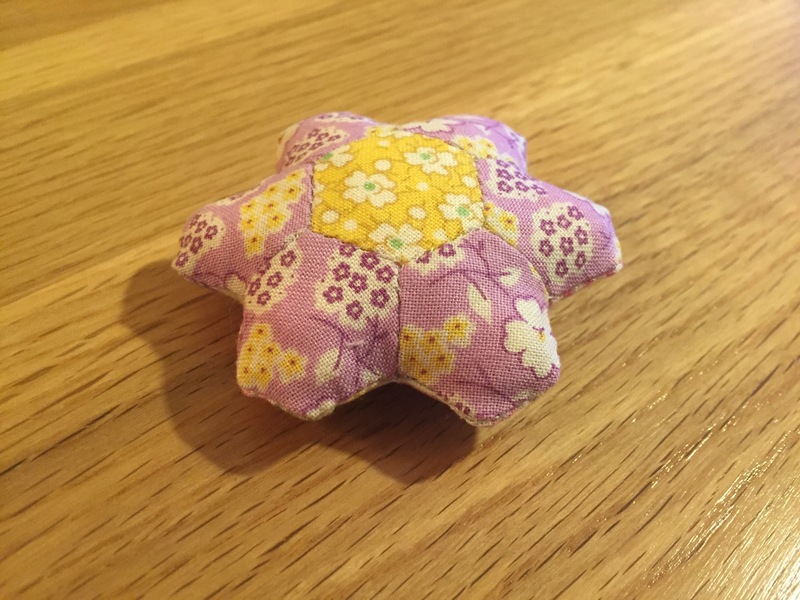 Despite being a keen patchworker, I didn’t really have a pincushion! My pins end up stuck in anything available to stab, so this little chap will definitely come in handy. I’m not as pleased with it as I thought I would be, I can’t put my finger on why though. Possibly due to fabric choice. But I’m already covering some more papers for a second attempt….pop back tomorrow to check my progress! Bargain Buys and a Beautiful Blanket! Fantastic morning! I was so close to not going to this particular event, but now I am SO glad I made the effort to go. It was a local fabric/crafting sale that was run by members of the Quilters’ Guild. And what a success it was too. On sale was a huge selection of fabrics, books, magazines, patterns, threads, and much more! And tea and cake, obviously. 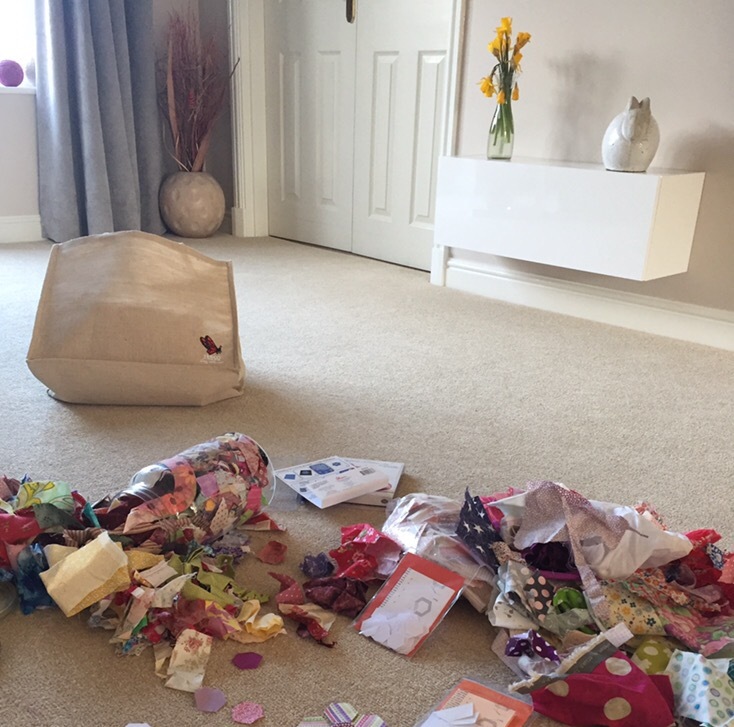 My very first purchase was a bag of scraps – pick and mix style from huge buckets, bought by the sandwich bag! What a good idea, I adore scraps of fabric and it’s so nice to think that I can make something out of scraps that probably would have been thrown away. These two fat quarters caught my eye, I have a nice collection of reds and creams and these will either join my collection, or they would make something pretty on their own. I don’t have any plans for them yet! I think these three fabrics might end up as a pin cushion. All from different sellers, costing a grand total of £1.10! Aren’t they beautiful? And they go together so well. And once again, I have no plans for these three yet, but just couldn’t resist them. They are right up my street! As well as fabrics, I also got these gorgeous patchwork blocks. They have been hand sewn by the lady that was selling them, and came either individually (50p each) or as a set of 16 blocks. As much as I don’t need any more half-finished projects, I really didn’t like to think of these dainty little blocks going to waste so I am looking forward to putting them together into a small lap quilt. I have my boyfriend’s mum to thank for these blocks, as I had actually run out of cash at this point! I am terrible at carrying money and nearly always only have my debit card, which is no use in a village hall out in the country! It does need a little work. It’s difficult to see in the pictures, but there is one little square that needs repairing as it is not very well attached any more, and one has already come out entirely. You might just spot the hole in the picture of the quilt spread out on my floor! The blanket is actually currently in my freezer (!). Freezing yarn/fibre/clothing is a way of eliminating moth larvae…..I guess you do learn something new every day – thanks mum! We don’t know that this blanket has been exposed to moths, but moth larvae do cause damage to fibres and it is one of many possible explanations for the damage. For the sake of a few days in the freezer, its’s a precaution I’m willing to take. I don’t have any plans to patch it up quite yet as I will need to source a matching yarn, so I’ll use the time wisely, just to be sure. And just in case one tiny granny square blanket wasn’t enough for me, I’ve also ordered some Drops Alpaca 4ply yarn in a selection of colours to make my own version! This little blanket totally inspired me. When my yarn arrives, I’ll be sure to post a picture. Hope you’ve all had a lovely weekend. Not only is it full of beautiful yarn from the Natural Dye Studio, there is a granny square blanket pattern, and 92 gorgeous finished granny squares! This has been untouched, under the bed for a long time so with mum’s permission I am taking over where she left off to contribute a few more granny squares! 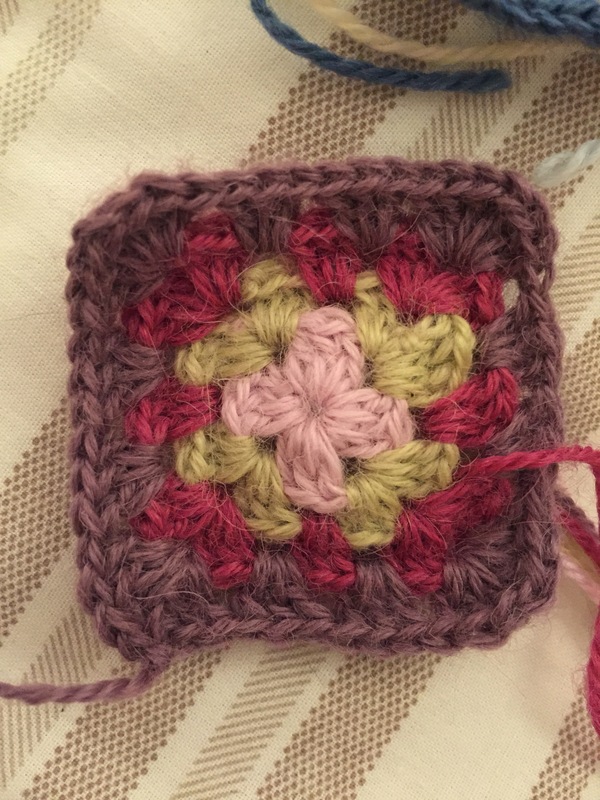 Apart from the fact that this is only my second ever attempt at a granny square, the only issue I came across was that my mum wasn’t sure what hook size she used. The pattern said 5mm, but my mum’s work looked like it used a smaller size. She thought she might have used a 4.5mm hook, so that’s what I started with. 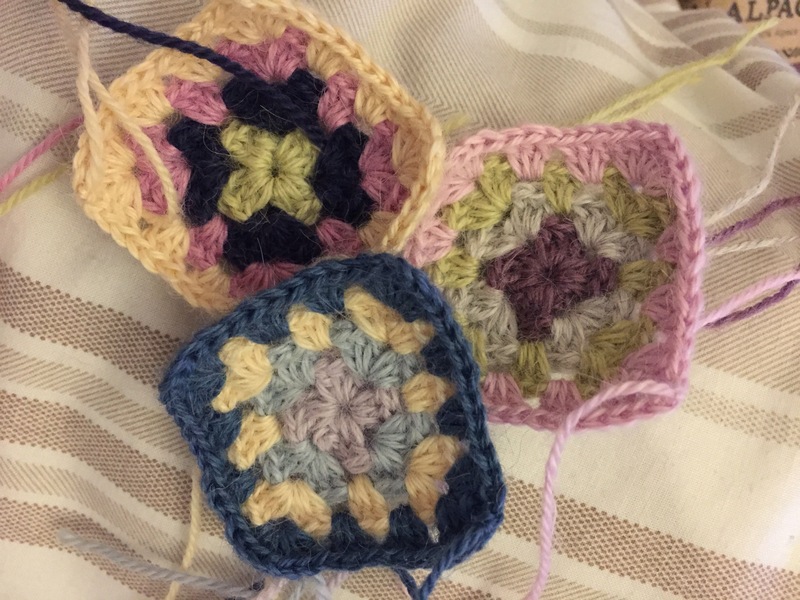 I’m not sure if it was purely just hook size or whether we have very different tensions, but my square turned out a lot bigger than the existing ones (my first attempt is on the left with the pink and purple border, the yellow bordered square is one of my mum’s). So I swapped my hook down to 4mm and consciously tried not to stitch too loose, and my second attempt came out much, much better (the middle one). Progress was hindered slightly by my little helper…. Meet Maisie, one of my four cats. She is ever so sweet but just like a toddler – into everything and I need eyes in the back of my head when she’s around. She loves nothing more than to get excitable when yarn is involved, although it usually ends in tangles! I wouldn’t change her for the world though. 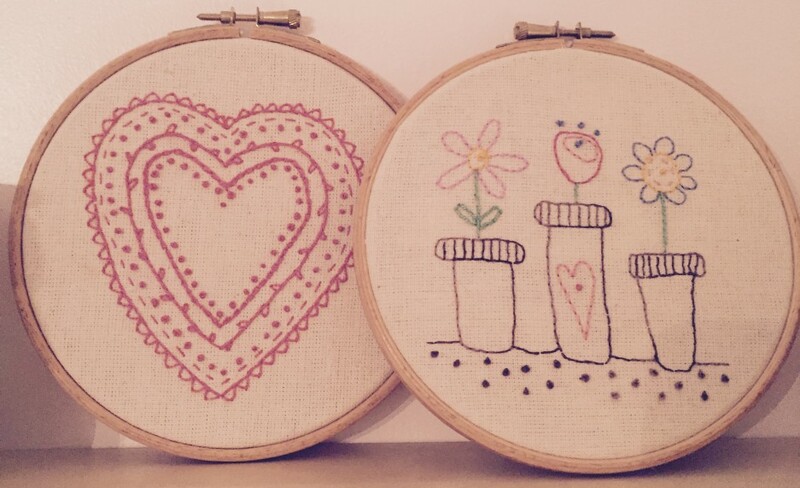 For those of you who saw yesterday’s post about my little frame, I have decided to go for some sewing related embroidery in each heart. I did end up getting distracted yesterday though, so I haven’t actually done it yet. When I have, I will provide photographic evidence! Thank you to Lucie for your input. For anyone who hasn’t already, check out Lucie’s blog – packed full of gorgeous clothes and crochet! As a very new blogger (3 days now! ), I am particularly enjoying the nature of blogs/bloggers and the journey that I end up taking from one person’s blog to the next via links/pictures etc., it’s a fantastic way of discovering new sites and meeting new people with similar interests. So much so that my poor university work has suffered this week while I’m busy being inspired by other peoples’ handiwork! I’ll start again with my work on Monday. Until then, I’m going to make the most of my crafty time. Pretty Little Frame – help! Today I have decided to do what I do best….start another project when I have so many things I really should be finishing. But I just can’t leave this pretty little frame empty any longer. Which would you choose? Or do you have any other suggestions? As promised from earlier today, here are some photographs of the bedroom stool before and after its pretty new cover! 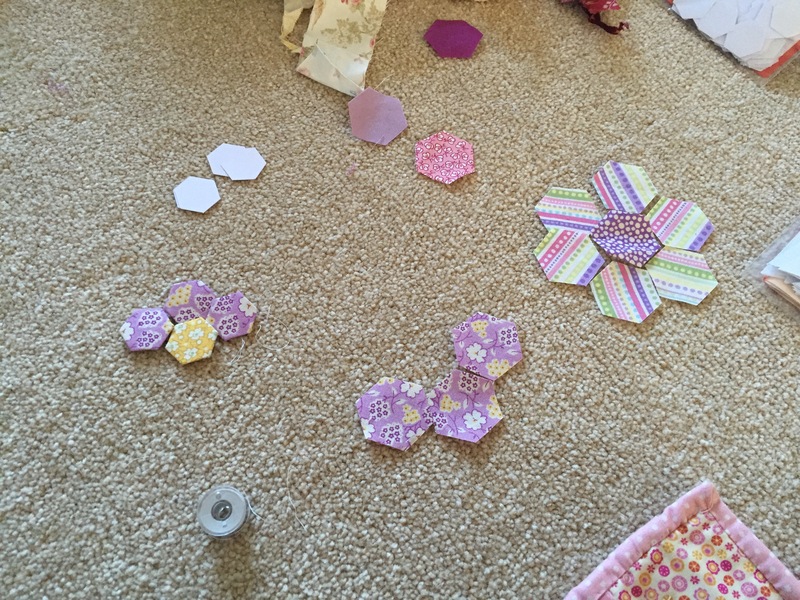 The cover was sewn by my mum, large hexagons in a selection of purple and lilac fabrics, pieced together by machine. The stool was ever so easy to dismantle and it didn’t take me too long to put the new cover on. I used a staple gun and just spread the new cover over the top of the old one. The trickiest bits were the corners! Overall, a pretty quick and simple job that makes such a difference to the room. 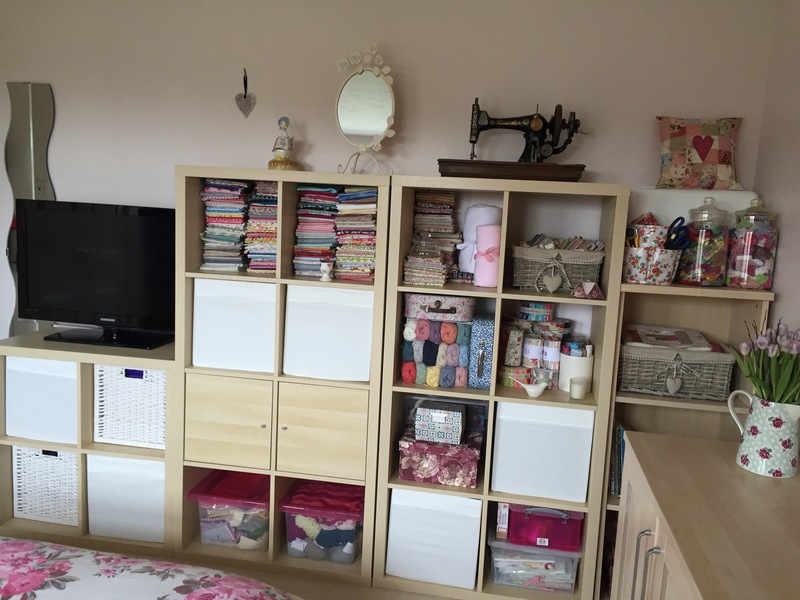 Now I’m feeling inspired to re-cover and revamp more furniture…..watch this space!